Managed - Games currently handled by Vortex. Discovered - Games Vortex knows are installed but not managed. Supported - All games Vortex supports that are neither discovered nor managed. If your installed game does not appear in the “Discovered” tab, you can have Vortex attempt to find it by running either a quick scan (from the toolbar) or a detailed scan (from the button at the bottom of the Vortex window). A detailed scan may take several minutes to complete. Once your game appears in the “Discovered” tab put your mouse over the game tile and click “Manage”. Vortex will automatically switch to that game mode. If Vortex cannot automatically detect your game, find it in the “Supported” tab. Click the game tile and select “Manually set location”. This will open a file dialogue where you will need to locate the folder where the game’s executable file (EXE) is stored and select that folder. Once you have done this, Vortex will add the game to your “Managed” tab. This content applies to Vortex 0.17.0 and above. 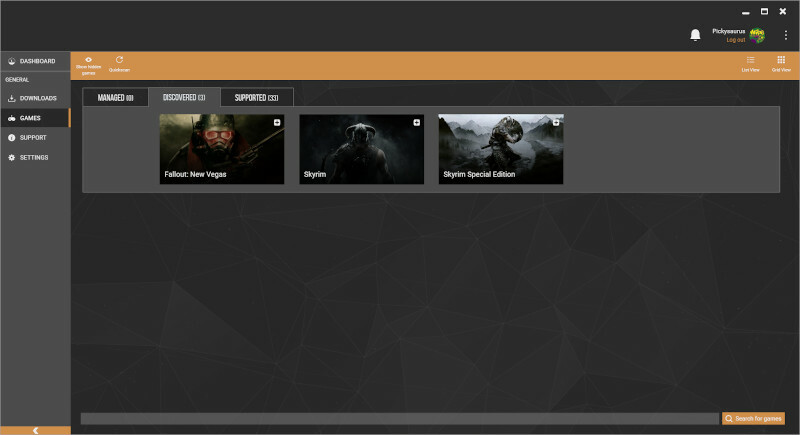 As of Vortex 0.17, the games page features a search option which can be used to find a particular game. This will include any games you have previously hidden. Typing the game name into the search box will filter each tab and the number of results will appear in the tab header. This page was last edited on 18 January 2019, at 16:50.